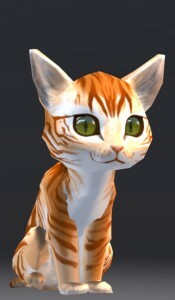 To wear the full avatar, wear the Kitten, tail, whiskers, one set of eyes (left and right), the eye control hud, full body alpha and kitten shape. The mesh body will shrink your avatar to 0.5m height automatically. You can adjust height, shoulder and hip width using system sliders. Two sets of eyes are available and the only difference is one set is light, the other is dark. Some furs look better with one or the other, some look neat with either. Avatar eyes are completely customizable. Eyelid State: Pick between Awake, Wary and Closed. Eyes will blink when awake. Iris Colour Menu: Choose from up to 10 iris colours. Use ‘Prev’ and ‘Next’ to view colour choices. Pupil Colour: Choose between black, red and glaring pupils. This product is constructed with a combination of mesh and normal prims. All items use completely original proprietary models, models and textures and are copyrighted by Aki Shichiroji. It is licensed for use, modification and non-transferrable duplication within Second Life. Redistribution or resale is not permitted, in part or in whole. Any attempts to circumvent the SL permissions system or to ignore the terms as stated in this document will be met with a DMCA complaint file and takedown. 1. The avatar floats slightly above ground. Why? TL;DR: This was done to allow for height adjustments, as the avatar may be resized using system shape sliders to make the avatar look like a more mature cat. Most stands and walks will accommodate this height. If this height gap poses a problem for you, please contact Aki Shichiroji directly to discuss possible modification. The Long Version: due to the way animations work with avatars in SL, any changes to avatar agent position will be reflected in actual distance rather than a percentage based on the scale of your avatar. This is why shorter avatars run just as fast as taller avatars. It’s also why animations which rely upon height change will often lead to unexpected side effects (most often causing avatars to ‘clip’ in to the prim or terrain they’re sitting/standing on). This gets even more complicated when one factors in the fact that many of the avatars I make are animals and require (to some degree) quadruped animations of some sort. The default height offset for the kittens is set to -.35m to accomodate for changes in height to the avatar via system sliders. This allows most bipedal animations to be compatible with the avatar without putting them in the ground overly much. 2. Are animation overrides available for this product? While separate seated and lying down animations are offered to supplement existing AOs, a full animation override is not yet available. In the mean time, several AO packages from Oracul (Qomic Ranger, Zet Beast or Small Furry) are highly recommended for regular use. 3. The avatar looks fine on my screen but either squished or elongated to others. How can I fix this? This is a viewer issue. Try detaching the avatar mesh and reattaching it. This should fix the problem. Thanks for taking the time to read through this notecard. Please let me know if you have any questions or concerns!